New Look, Better Interaction, and New Widgets! The widget icons are bigger; no more squinting. Roll your mouse cursor over a widget icon and you'll see a tooltip with a short description of the widget. This way, you can see what it does before dropping it onto your site. When you’re dragging a widget into your site, our improved drop zone shows exactly where your widget will appear on the page. Forms: Our new form widget allows you to add a “contact us” or custom form to your site. You can change almost anything in the form. Add radio buttons, specify default values, create a message that visitors see upon submitting a form, and more. 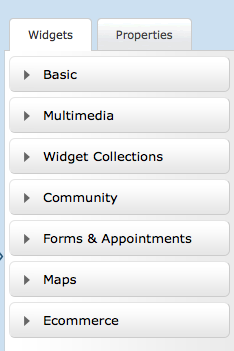 Our form widget is flexible so you can get exactly the information you need from your visitors. MP3 Player: Want users to hear music on your site? Now they can. This MP3 player drops right onto your page. Google Translate: In this global economy, you can have visitors from Albania to Zambia and everywhere in between. 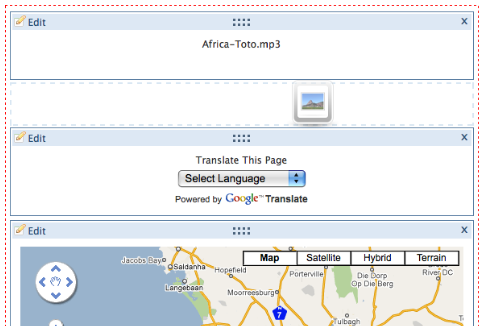 With the Google Translate widget, your visitors can view your site in their language. Of course, it’s not quite a perfect translation, but it’ll get the message across. We’re always looking for ways to make it easier for you to make a website. We love hearing what you have to say through Community Forum, Get Satisfaction, or from user research. Thanks, and keep your comments coming! Great job!!!! Nice look and feel.....Love the mp3players...nice and simple with a volume control...Can stack them very neatly for those wanting to sell their music. One thing that is not good and maybe needs to be fixed is the html widget....When you save the next time you use the html widget in a different spot the last code is still there....Having to delete it each time will be annoying. Yeah,,, the Html widget is pretty ruff,, once you have deleted the script in the page you cant add your copied work. It replaces it with the script you just deleted....Not really a working widget right now. Oh nice catch John! That would definitely be annoying! I've logged this as a bug. I love the new look! Good job Yola! Very nice - but what happened to Form Assembly? Can I still use it? Hi Russell - you can certainly still use Form Assembly. Add the code they provide by using an HTML Widget (we've removed the Form Assembly Widget from the Sitebuilder). 3) Box where user has to type in characters displayed on the screen (to stop auto-bots). If I could these 3 things I'd definitely use and recommend the new form. But in any event a useful addition and certainly a good start - thanks! Thanks Russell for sharing your feedback. I will pass this onto our development team to consider for future upgrades. Thanks for that. I've also spotted another issue which will prevent people using it for sites they create for their clients (like I do). The form submission gets sent to your Yola profile email - you can't change the email address it gets to site by site. This is somewhat restrictive. I love the smooth flow with the icons in the accordion menu. It gives a nice relaxed feel to an already laid back Sitebuilder. How do I add my own code for a widget I designed? It seems in an effort for simplicity that individuality has suffered to some extent. Thanks Callum! Karen - the HTML Widget is there for you to add your code. Will you give it a try and let us know if you have any problems? Nice! Gonna go over there now! Thanks yolafan for your positive outlook and comments! I just wanted to say thanks for the updates and changes. I love that you can create forms here now, it was such a pain and inconvenience sometimes to use 3rd party forms. Thanks Christie! I agree - it is definitely easier to add a Form with our slick Form Widget! Thanks Terrry! Hats off to our fantastic Product and Development teams who made this happen! I've had problems using traffic counters. Every time I opened my Yola website, the counter had reset to zero so I removed it. I'm not tech savvy, especially when it comes to html coding, so it may well be something I've done while trying to load it. Would Yola consider adding its own traffic counter widget that could simply be dragged over to a web page? Thanks Sanja. I'll look into it now. I use Google Analytics and it is awesome! It gives you the state, the city, the country, the refferer url, and everything else! Also it has a map overlay, the absolute unique visitors, and so much more!!! I like the new "Set page title" box! Its not a borwser box anymore, it is right in the site builder with a lightbox! That is so awesome!!! I agree - it does look good! Wow! Never noticed that, it looks so... um... EPIC! I really like the new look and the widgets especially the mp3 widget. however, is it possible to hide the track name beneath the player? I really like the new color. And I love the animation with the HTML widget! It fades and zooms! - So awesome!!! Thanks, Yola! I added a simply form to my contacts page (http://www.littlesticks.co.nz/contact...) and I already have people using it. Great! I love the changes Yola . . . absolutely wonderful. However the HTML widget takes forever to load in firefox, but all's well when I use it in IE. Thanks for taking the time to share your positive feedback!